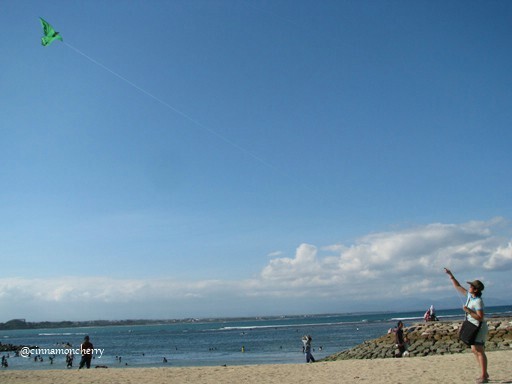 When my partner and I went to Bali in late June/early July, we noticed that there were plenty of kites decorating the sky. Locals told us, "Oh, it's the kites season. Plenty of wind for that." 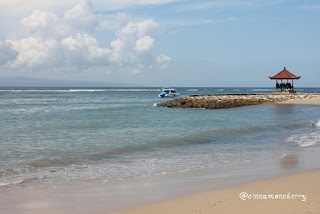 So on Sunday afternoon, we decided to take a cab to Sanur beach. 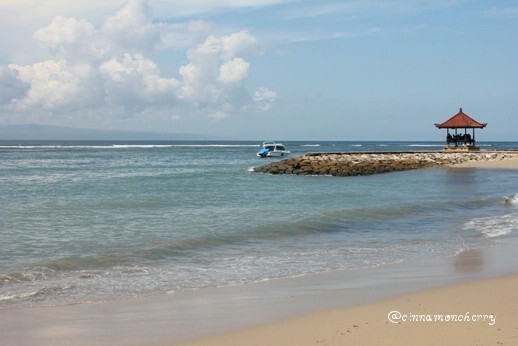 Sanur has always been one of my favorite beaches in Bali, not too crowded, light golden sand are abundant, and plenty tasty, affordable foods around it. After having lunch, we bought a kite and tried to fly it right away. (In July 2012, one medium-sized kite in the shape of a bird costs about IDR 10,000 - 25,000, depending on your bargaining skill) First, we tried tying a piece of string to it, then... the kite sorta fall gracelessly towards the sand. We looked at each other and shrugged. We tried again. Again and again, the kite decided that the sand was to be its favorite destination, instead of the sky. We had a good laugh (and I bet plenty of people watching us had a good laugh, too) and tried again. We failed miserably for so many times until a local guy took pity on us and helped us. He worked magic on our kite and string, and soon the wind worked his magic and we could fly a kite! (Please note that this is the first time, ever, for yours truly to be able to fly a kite!) So you can imagine me jumping up and down, tugging the string whenever I felt like it. In short, it was FAB. 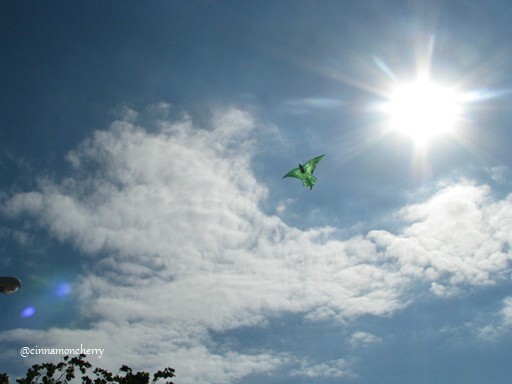 I think we inspired many visitors to try flying some kites too, that day. 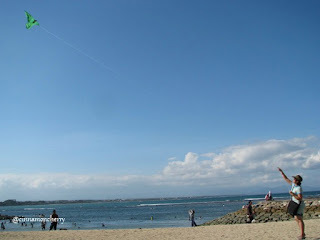 Some asked us where we got the kite and one even bought a bigger kite, about 5 times bigger than ours! Talk about being competitive, man! Thankfully we were content playing our medium-sized kite, and it flew beautifully in the sky for... lemme try to remember, one or two hours, until we decided that the sun was getting too hot for us. And the guy with bigger kite didn't last that long, perhaps the kite was too heavy for him, ha! My partner and I had a wonderful time playing kite. True, we're grown-ups and all but so what? And after a while, you can just tie the string to a rock or something and watch it soaring in the sky. We bought some cans of drinks and sipped some juice while playing the kite. 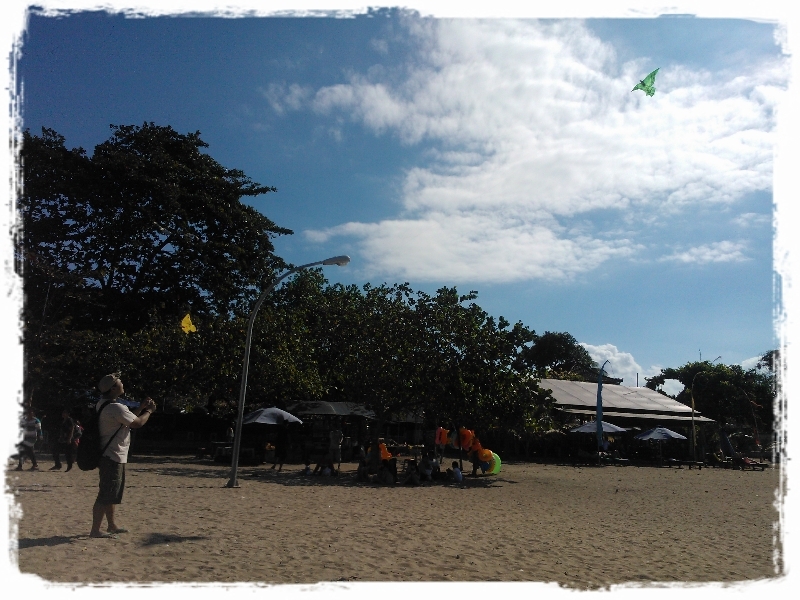 I hope one day we'll be able to play a kite in Bali, again! Maybe in different beaches, with our kids? We shall see!